A struggling musician has embarked on a worldwide tour without leaving her basement in south-west London. 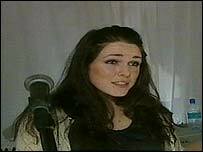 Sandi Thom, 24, has been performing for free using a webcam to broadcast live on the internet from her Tooting flat. From an initial audience of 60 people, more than 60,000 are estimated to be logging on to watch her evening gigs. Ms Thom, who has been compared to fellow Scot KT Tunstall as well as Janis Joplin, hopes the exposure will help raise her band's profile. She told BBC News online she came up with the idea after going on tour with a car that would constantly break down. "We thought: 'Surely there must be a way you can gig and not leave the house?'." Her manager got hold of a cheap webcam, and with some even cheaper Ikea furniture, her basement was ready to broadcast to the world. "We've had an incredible response to this," said Ms Thom, whose three-week Twenty One Nights From Tooting tour ends on 16 March. The band has since received emails from fans in Russia, Canada, Pakistan and the US. She said: "On the first night we had about 60 people in the first minute, and then it grew to about 600 after the first night. "It's just escalated from there and now I think we're on something like 60,000."